1 March 1908: Entered Army service as a Leutnant in 1. Großherzoglich Mecklenburgisches Dragoner-Regiment Nr. 17 after passing out from the Prussian Cadet Corps. Remained in Army service in the post-World War I German Reichswehr. (As of) 1 May 1930: On the staff of Cavalry Regiment 14, Ludwigslust. 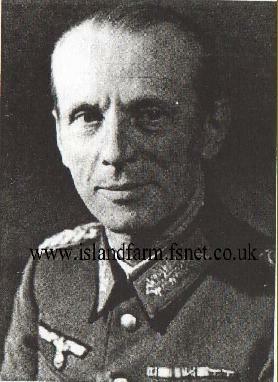 1 October 1934: Commander of Cavalry Regiment 15, Paderborn. 1 March 1938: Commander of the 2nd Rifle Brigade. 10 November 1938: Commandant of the Fortifications of Breslau. 1 September 1939: Chief of the General Staff of the XXXIV Corps Command. 25 April 1940: Commander of the 442nd Landesschützen (“Territorial”) Division. 11 October 1940: Higher Field Commandant 365. 5 January 1942: Commander of the 330th Infantry Division on the Eastern Front. September 1943: Commander of Army Area Center on the Eastern Front. 1 January 1944: Leader of versch. Corps i.V. 9 March 1945 transferred to Trent Park Camp 11 sorting camp. Abrams and his outfit [37th Tank Battalion] destroyed more than 300 German motor vehicles, 75 artillery pieces, 75 antitank guns, 15 Tiger and Panther tanks, 20 ‘screaming meemies’ and overran a rear-area German hospital with 80 patients, three enemy ammunition dumps, one ordnance depot, one fuel dump and a German army corps headquarters where an annoyed German lieutenant general and most of his staff were captured while still at their desks. German Cross in Gold: 5 November 1942, Generalleutnant, Commander of the 330th Infantry Division.